Few men are as revered in my home state of Texas as those who held off the mighty Mexican Army – led by the self-proclaimed “Napoleon of the West,” dictator Antonio Lopez de Santa Anna - for 13 long days in the spring of 1836. The blood sacrifice of men like William Barrett Travis, James Bowie, James Bonham, and David Crockett bought precious time for General Sam Houston to train and prepare his ragtag troops for a final confrontation with what might have been the mightiest army in the Western Hemisphere. The tale of the defenders of the Alamo is as interesting as it is tragic, but that is not the story I want to share with you today. 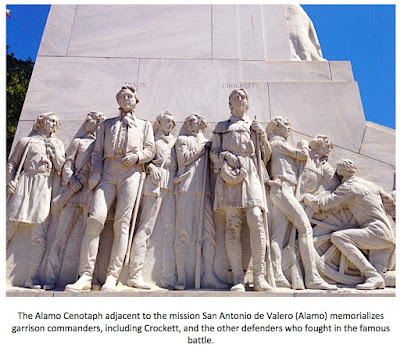 Instead, I want to share a little-known tale about arguably the most well-known of the Alamo freedom fighters: David Crockett. It is a story with which most Texans are not familiar, much less anyone outside the Lone Star State. As a matter of fact, it is a tale I had never heard until very recently. It is incredibly strange, but undeniably fascinating. “William and I were pushing through some thicket, clearing the way, when I sat down to mop my brow. I sat for a spell, watching as William made his good and fine progress. I removed my boots and sat with my rations, thinking the afternoon a fine time to lunch. As the birds whistled and chirped, and I ate my small and meager ration, I tapped my axe upon the opposite end of the felled tree I rested upon. “Whether it was the axe’s disturbance or possibly the heat of the sun which caused an apparition to slowly form in front of my eyes, I know not. As a Christian man, I swear to you, Abe, that what spirit came upon me was the shape and shade of a large ape man, the likes we might expect among the more bellicose and hostile Indian tribes in the Territories. The shade formed into the most deformed and ugly countenance. 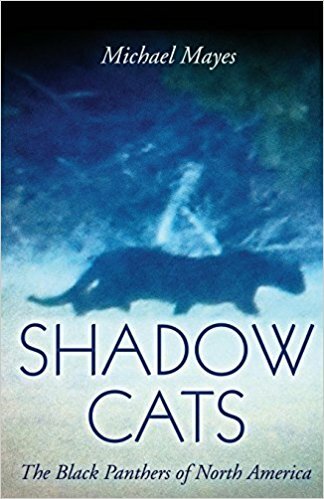 Covered in wild hair, with small and needling eyes, large broken rows of teeth, and the height of three foundlings, I spit upon the ground the bread I was eating. Less than six months after the writing of this letter, Crockett was killed at the Alamo along with approximately 190 others who dared stand in Santa Anna’s way as he and his Mexican Army swept north and east in an attempt to snuff out the Texas Revolution. That being the case, no clarification on the information in the Burgin letter was ever given. Most historians feel that the account in the letter was just an attempt by Crockett to entertain his brother-in-law. Some, however, feel differently. Many point to the fact that Crockett “swore” his account was true not once, but twice in the letter. They also point to how Crockett had insisted on changing the wording of the “Oath of Allegiance” as evidence that he took his honor seriously (The wording changed in the oath included the addition of the word Republican before the word government. That way Crockett would not have been obliged to defend a rogue government run by a non-elected dictator. It is this very change in the agreement that allowed Crockett to fight against Santa Anna with a clear conscience). Would Crockett have sworn the tale was true in writing if it did not occur? The entire matter of the creature/apparition appearing and verbalizing a warning to Crockett is about as bizarre an incident as I have ever come across. 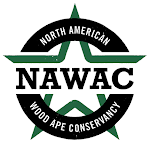 Certainly, the description of the creature given by Crockett matches the classic description of a wood ape or sasquatch. The "ugly countenance, covering of wild hair, and the small and needling eyes" described all sound familiar. So does the estimated height of "three foundlings" (while there is no exact height of a foundling - a small abandoned child - most agree a safe estimate for this description would be somewhere between 7 and 8 feet). That is where the similarities between Crockett's creature and credible modern bigfoot accounts end. The claim of Crockett that the creature spoke to him and actually warned him to leave Texas is utterly unprecedented. I simply do not know what to say about it. Crockett's description of how the apparition slowly formed and later disappeared, "like the morning steam off a frog pond" makes the entire incident seem more likely to have been a lucid dream or hallucination of some kind. Again, it is all very strange. 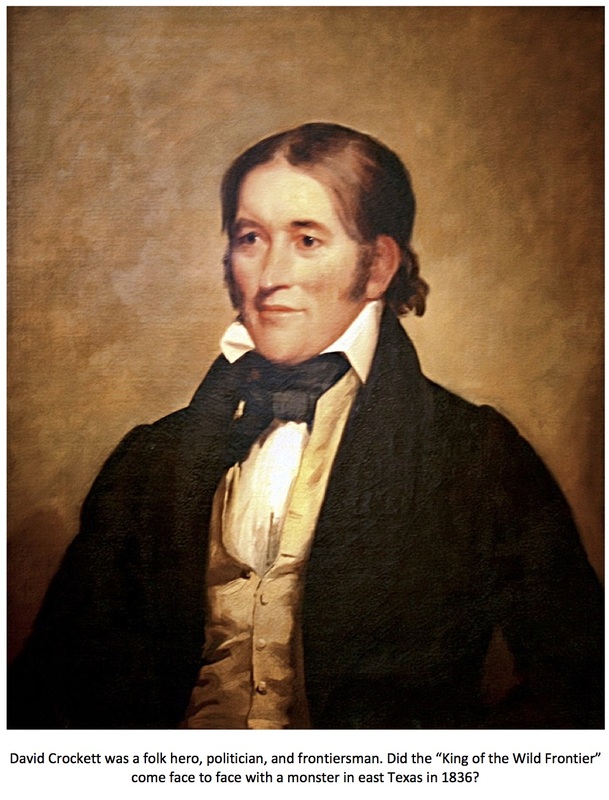 What did David Crockett see in the woods near Nacogdoches in 1836? The likelihood is that we will never know. Something telling, however, is how few people have heard of this account. So many of Crockett’s feats and experiences have been trumpeted and blown up to mythic proportions through the years that it seems strange that this tale has fallen between the cracks and remains largely untold today. On second thought, maybe it isn’t so strange after all. Americans like their heroes, especially those in the distant past, to be without blemish; perfect images chiseled in marble. These heroes, men like David Crockett, are revered to this very day and held up as icons. The legacy of such a man might be tarnished if such a story leaked out and became well known. Better to dismiss the tale as nothing more than a bit of “yarn-spinning” on the part of good old Davy than to attempt to come to grips with the possibility that something genuinely strange happened in the deep woods of east Texas in 1836…something very strange, indeed. Xerxes, R. John. “1836, Nacogdoches, Texas: Davy Crockett and the Bigfoot's Prophesy.” Bigfoot History, Wordpress, 15 May 2012, bigfoothistory.wordpress.com/2012/05/15/1836-nacogdoches-texas-davy-crockett-and-the-bigfoots-prophecy/ . “The Burgin-Crockett Connection.” The Burgin Family, theburginfamily.org/crockett.html. Stewart, Jeff. 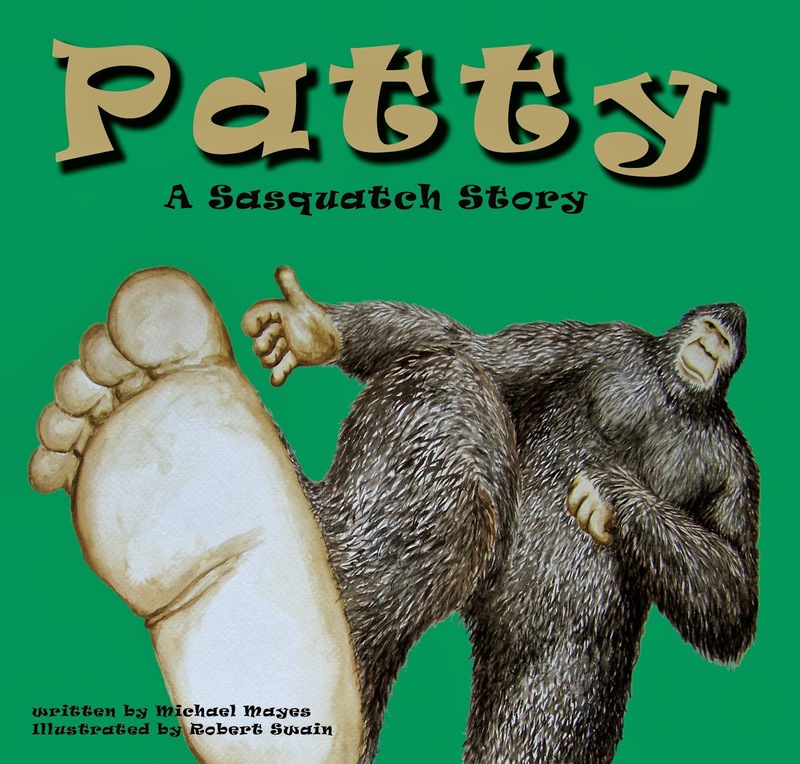 “Bigfoot in Texas? Read This.” Fish and Game, May 2017, fishgame.com/2018/05/bigfoot-in-texas-read-this/.